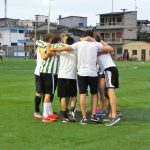 Football game in Montañita…staff vs students. The language school is located on the hill behind the town. Here you will have breath taking views over all of Montañita and the surrounding coastline and it is the perfect place to check out the waves between classes. Just recently the school moved to this characteristic building, so all is newly decorated. 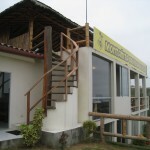 The passionate teachers, beautiful location and relaxed ambience will make learning Spanish a very pleasant experience. With a lot of pleasure the grammar is explained and with interactive games the teachers will help you to speak Spanish easily. On top of the lessons, we strongly recommend to take part in activities such as; yoga, salsa lessons, surfing and scuba diving. The school occupies the two top floors of the premises. The first floor is a beautifully decorated modern building which houses 4 class rooms. The floor above is a very large terrace area where also lessons can be provided. Up there you may attend classes with the whole town and coastline as your backdrop while sheltering under a bungalow style hut. Don’t let these views distract you ;). At school you can also use (Spanish) books, cd’s and dvd’s to practise your Spanish. For an internet connection you can go to an internet café in the centre town, within a minute walking. The beach is just 3 minutes away.